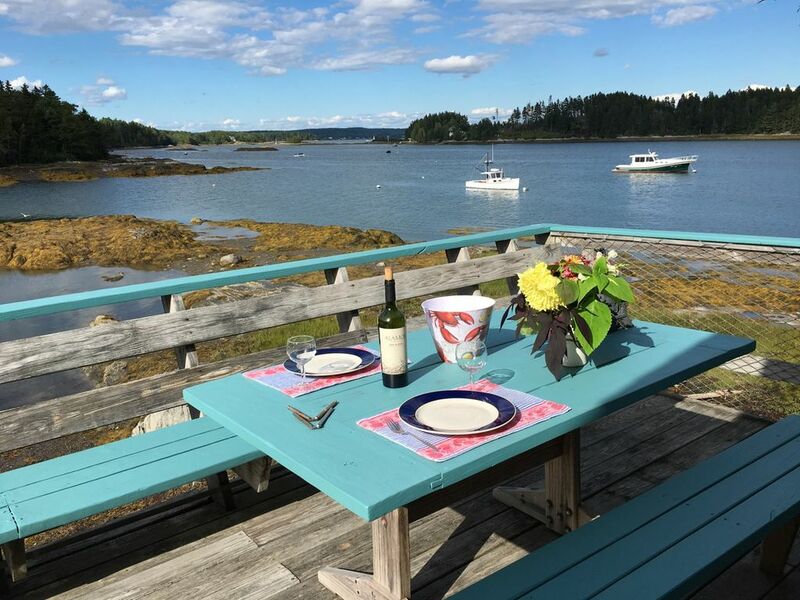 Osprey's Nest provides you with peace and quiet and is a perfect home-base for exploring Mid-Coast Maine. Osprey's Nest is the whole second floor of a two story house and has its own outside stairway entry. Relax and enjoy the views, watch the lobster boats and recreational boating, and coastal wildlife including seals, eagles and water birds. Launch your kayak directly from our yard. We have a number of islands that are fun for kayakers to explore, and the our waters are generally calm and perfect for kayaking. Osprey's Nest is a spacious 2nd floor "home away from home" with a 10 by 25-foot deck right at the water's edge looking toward Hopkins Island and Dingley Cove and the picturesque Maine coast. Watch the tides come and go over the rocks below you. Bright and sunny....enjoy the beautiful sunrises; summer evenings are lazy and long and can be enjoyed from the deck or sofa. Original family artwork on the walls! You enter into the kitchen and a generous eating area. There is a nice sized bathroom with stall shower. The bedroom has a queen-size bed. The spacious living room has a double-size sleeper (pull-out) sofa, and another sofa and a comfortable lounge chair. Walk into Cundy's Harbor and buy your lobsters at Watson's General Store, which has been featured on TV, and have your dinner in the pot in minutes. Cundy's Harbor is a little gem. It is an unspoiled active fishing harbor and village. From late May to mid-september you can eat at the restaurant (byob) on the wharf. They offer all sorts of fish dinners/lunches, ice cream, etc. And there is a cute seasonal gift shop and general store to explore. Public boat ramp is two blocks away. We are located right between the Portland/Casco Bay area just to our south and the Midcoast Maine area just to our north. Offers tons of day trip opportunities. Bath, Boothbay, Camden, Wiscassett, Portland, Freeport, etc, etc. Museums, hiking, beaches, antiquing, shopping, eating, exploring villages and seacoast. PLEASE NOTE: Use of our linens and end-of-stay cleaning are optional. Those services are in your quote, but can be removed. Use of our sheets and towels is $25 for two people, $35 for four. Post-stay cleaning is $75 if you would rather not do the cleaning as described in our Rental Agreement. (Renters are asked to leave Osprey's Nest as clean as they found it unless they pay the cleaning fee.) During your inquiry, please let us know if you would like us to remove either of those fees. We have a no pets policy. Additionally, Osprey's Nest is not appropriate for children. There is a downstairs apartment that sleeps two and we own and rent the cottage next door that sleeps six... could be a great setup for a couple families wanting to be near... but not too close. VRBO #s 23126 and 24124. We have enjoyed making Osprey's Nest a comfortable and welcoming home-away-from-home for our visitors. This has been a family project with each of us having a hand in welcoming you. This is what really makes our location exceptional. You can't get closer to the water. Blankets & pillows provided. Sheets and towels for a small additional fee, or bring your own. 1 spot beside the house; additional across the street. Starter amounts of cooking oil, seasonings, sugar, etc. Also, starts amounts of paper products. Cleaning supplies provided. HDMI cable available to connect your PC to the television. Small yard, but you'll probably just use the deck. We cannot provide a kayak or canoe, but we have a launch area on the property and you are welcome to bring your own or rent from a company in Brunswick (will deliver). Large deck with seating and a picnic table. Wonderful vantage point over the water. Staying in this home was an absolute joy! My husband and I had a great week. Kayaking off the property was great, endless opportunities. Great restaurants in Brunswick and on Orr’s island. The house was perfectly stocked and the option to bring own sheets and clean ourselves, were appreciated. Accessibility to popham beach, Portland make this a great option! Thank you for opening up your home to us. Only concern was that the Cundy harbor area kind of shuts down after Labor Day, causing us to have to go elsewhere for everything. It was perfect for the theee of us. Even had a closet space for the third person. The cottage is a gem and the location one of the nicest places to stay. So much to do in and around Brunswick. This included concerts on Wednesday and Thursday evenings and farmers market on Tuesday and Friday in Brunswick and Saturday in Harpswell. Also watched seals in our cove this time. Appreciated the fans that were provided. They kept us cool on warmer evenings. Beautiful area and nice accomodations. It was excellent - We enjoyed the area and the apartment very much. It was clean, in good condition and well stocked. We appreciated the book of things to do and made good use of it. The only two issues we encountered were that the grill doesn't work well and there were small ants in the kitchen. We would certainly stay there again. Thanks for letting us know. We will tackle the ants (that appear now and then) and get right to fixing the BBQ. We want everything to be as perfect as we can make it. The property and the area are perfect for a quiet, relaxing time away. Absolutely loved our week here -- from the beginning...you arrive and walk out on the little deck and look at the water and think aaaahhh....LOVED my AM coffee and book on the deck watching the birds and the boats. You can slide your kayak right in-- a few feet from the door , and jump in for a (brisk) swim just as easily. The house is clean and bright, great kitchen supplies, quality furnishings, great art work, not cluttered. The owner/hostess is easy to reach , responds quickly to messages and very helpful. Can I go back now, please? Older property but nicely maintained with beautiful views and abundant wildlife especially birds. In easy driving distance to most of mid-coast Maine. Very comfortable. Deck could use updating but it affords spectacular views. All in all very enjoyable! We have the perfect spot from which to launch your kayak or canoe. There is live theater at the Maine State Theater and music at the Summer Music Festival, and it's just 25 minutes to shopping in Freeport (LL Bean). Lots of day-trip opportunities to Kennebunkport, Bath, Boothbay, Wiscasset, Camden, and all of Mid-Coast Maine. Walking and hiking trails are easy to find. Visit the Bath Maritime Museum, local fairs, antique shops in Wiscasset, and much more. We have a notebook full of brochures. Note: Saturday is our normal turnover day. We can sometimes accommodate arrivals and departures on other days. Please see wording in our description about optional fees for use of our linens and our cleaning fee to do your end-of-stay cleaning. You are welcome to take care of these yourself and we will remove those fees from the quote. Just let us know before final booking.